We were driving to visit the in-laws this weekend when an image and a phrase popped into my head. 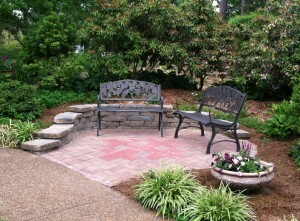 The image was of the small patio/seating area we had recently completed at the Memorial Garden. The phrase, Not Afraid of Curves. I have constructed things all my life. I have early memories of helping my father build a carport, a cabin/“fort,” fencing for our pony pasture. Mostly, the things we built then, and the things I have built since, were rectilinear. Straight lines and right angles. Sure, there is the occasional deviation from 90 degrees, roof slopes being an obvious example. But always for a good, practical reason. Nancy and I build things, too. In fact, on one of our earliest dates, she informed me we’d be assembling a shelf—a simple shelf, it turned out— to sit on her desk. Early as it was in our courtship, I already knew her well enough to recognize that exercise as a deliberate test of our compatibility. But building with Nancy often throws curves (pun intended) at my native practicality. She will introduce an angle or a curve, for aesthetic reasons, where practicality and efficiency would be be content with a straight line. Our mudroom is an example. The addition to our house that we built early in our marriage included a long room that was mostly Nancy’s studio but also, at one end, the primary family entrance. Each time that outer door was opened in winter, an arctic blast cooled her whole studio. We needed a wall to subdivide the space into studio and mudroom. But the dividing wall was problematic as the existing doors and windows precluded a normal, straight wall. So the wall we built has three segments. It leaves the room’s sidewall at a right angle, then jogs to the left at 30 degrees, then returns to the original heading before contacting the opposite wall in another right angle. The doorway is a wide opening in the angle section, with French doors. We were to finish off the mudroom with ceramic tile on the floor. Then, Nancy threw in the kicker: “You know, of course, that the tile have to be laid on the angle.” Of course. Mutter. Mutter. It turned out to be only a slight inconvenience. Ten minutes to make a simple jig for the wet saw we would have rented anyway, and cutting triangular edge pieces was as simple as the rectangular ones would have been. Don’t get me wrong. Our joint building projects are collaborative affairs, and Nancy is open to the arguments of practicality. 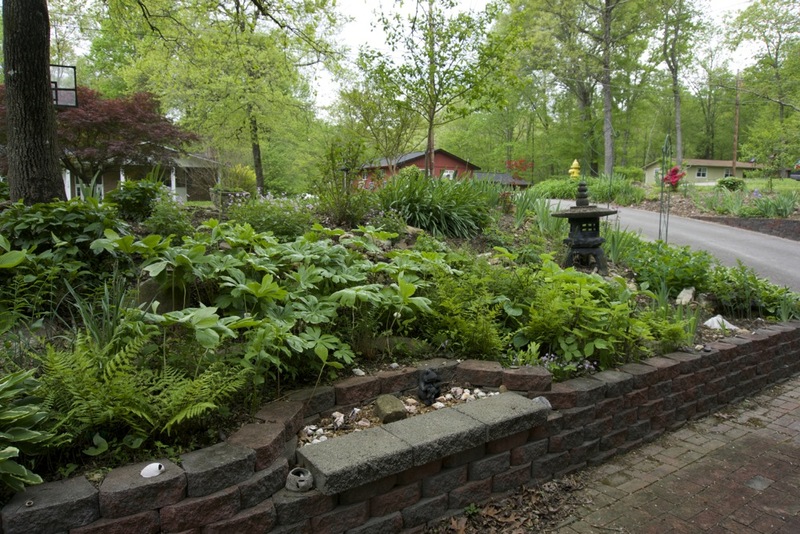 The retaining wall at left is an example. 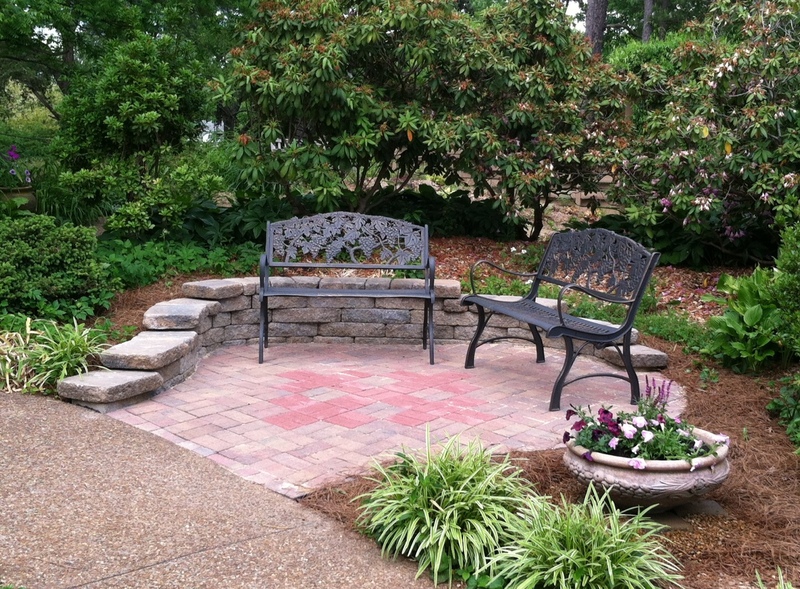 Nancy wanted a curve in the wall, and I wanted to use the existing rectangular brick floor as the foundation. My suggestion for the built-in bench satisfied both criteria. I could give many other examples of things we have built over the past 25 years into which, by intention, some curve or angle violates the grid work of my engineering mind for the sake of aesthetics. And I expect that it would be true in each instance that there was a point in the planning or execution when I rebelled at the impracticality and the extra work involved, and had to be convinced that the outcome would be worth the extra effort. Reflecting back on where we started, with an image and a phrase appearing simultaneously and unbidden, I realize that on this latest project, I did not have to be led down the aesthetic path, but followed it willingly, even eagerly. The site dictated the curves, and the fact that our floor was to be of rectangular elements (brick pavers) was not an impediment. Of course we would rent another wet saw and cut the bricks as needed. Of course. It seems like a growth step. When we married and bought the home we still live in, we acquired a “master bath” the size of a closet. Nancy was a self-employed graphic designer and avocational artist, with limited office and no studio. I was a sometime woodworker in need of a shop. In short, we immediately began planning an addition to the house. The studio and shop were relatively easy. But the master suite was a design headache. We wanted to take advantage of the second story view into our woods. But moving the sleeping area into the new space left bath, closet, and dressing areas in the old space. And we could not find a configuration that worked. Proportions were wrong; traffic patterns were unwieldy. The house had plenty of lesser needs, so we tackled those while continuing to chew on the design problem. We mentally “let it simmer.” (Or stew. Or soak.) It took a year to work through the smaller needs—and for the solution to our design dilemma to emerge. From our second story, privacy is not an issue, so the solution was to leave the sleeping area in the interior, put the bath/closet/dressing area in the exterior (new) space, and let the view in through large windows. A master bath with a picture window. Our house also had a side porch off the living/dining area, with a large deck behind the porch. Again, the configuration did not work for us. We tried and tried to think of a way to sit outside in comfort and convenience, but the back drops off quickly and getting to any outdoor space involved excessive movement in both horizontal and vertical directions. We could not come up with a design that worked. So again, we put action on hold and let the need simmer. Years later, as Nancy’s ornamental garden was taking shape, the solution to our outdoor room dilemma came clear. Our outdoor room should be in the front, not the back. The front yard is level and on practically the same elevation as our main interior living space. Our street is a quiet cul-de-sac so traffic noise is not an issue. 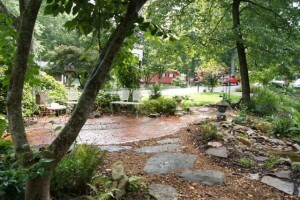 The large black cherry overhead and the berm we had built halfway to the street provide a sense of enclosure and just the right amount of privacy. We both grew up in a back yard era and ours is not a front porch neighborhood. But the front is definitely the direction that works for our house. 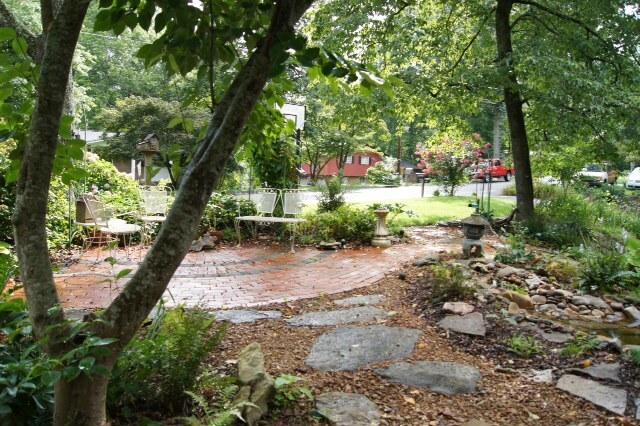 Our front yard patio is convenient, frequently-used, and a visual delight from inside or out. This “strategy” of letting a problem simmer seems to involve more than just the element of time. Time is certainly a factor: If we have the luxury of time, we can search more widely, think more deeply, explore more options. But I think “letting it simmer” is more importantly an act of faith in which we do not accept second best. Instead we wait patiently for the right solution to emerge. In large ways and small, when I have had the luxury of time, and the patience and faith to wait, I have been richly blessed.